• Frame - Two-piece 1/8" thick x 7/8" wide construction. 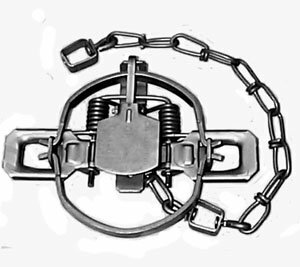 Center mounted chain. • Pan Post - Cross with integral gusseted pan post and hole for pan stop hardware. 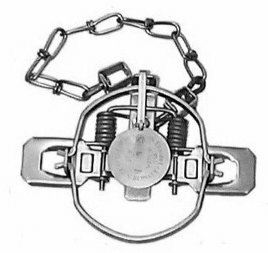 • Standard Jaw - 4-7/8" jaw spread, 5/32" x 1/2" with corner radius to prevent cutting. 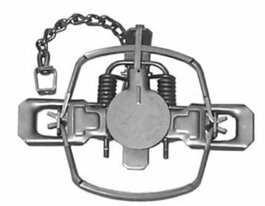 • Offset Jaw - 5" jaw spread, with a face that averages nearly twice that of the standard jaw. 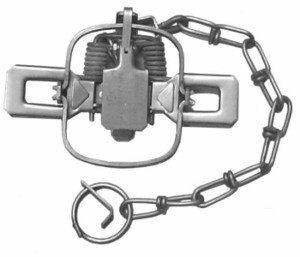 • Chain - #2/0 double link, with two swivel points, ring and drowner. 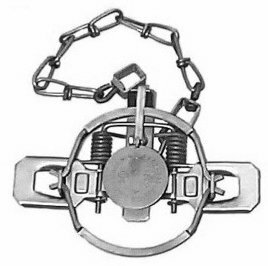 • Pan - Two-piece construction with crimped bolt and nut. 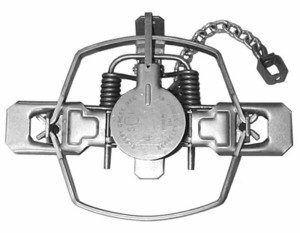 • Springs - Heavy duty 10-gauge spring wire. 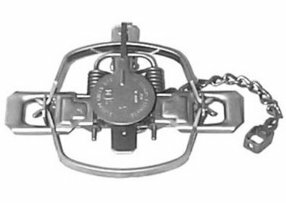 • Levers - Heavy duty .075" thick steel. •Frame - Two-piece 1/8" thick x 7/8" wide construction. 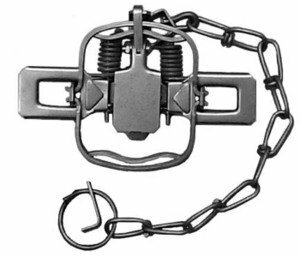 Base is reinforced with 1/16" thick chain strap with center mounted chain. • Cross - Integral gusseted pan post with installed pan post hardware. • Standard Jaw - 5-3/8" spread, 5/32" x 1/2" with corner radius to prevent cutting. 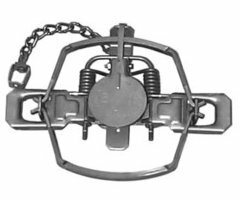 • Offset Jaw - 5-9/16" spread. Face averages nearly twice that of standard jaw. 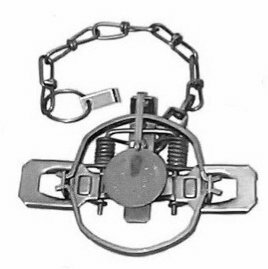 • Chain - #2/0 double loop with three swivel points. 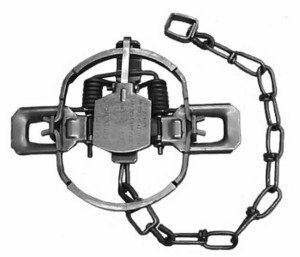 Standard jaw trap has standard chain assembly; offset jaw trap has short chain assembly. 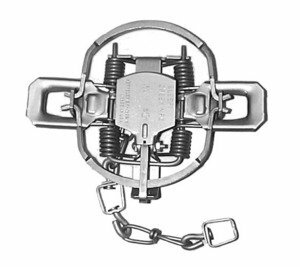 • Pan - Straddle pan has a notch to allow for visual dog engagement and is attached with 8/32 brass bolt and nut..
• Springs - 4 coils are wound out of .125 diameter music wire for holding power..
• Weight - 1 pound 9 ounces, standard; 1 pound 8 ounces, offset. • Frame - Two-piece 1/8" thick x 7/8" wide construction. 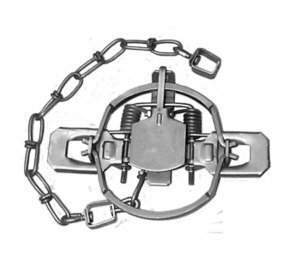 Base is reinforced with 1/16" thick chain strap with center mounted chain. 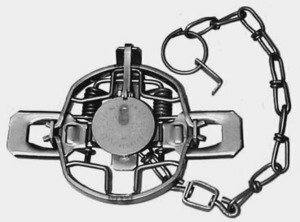 • Pan Post - 1/8" thick and welded through the cross. 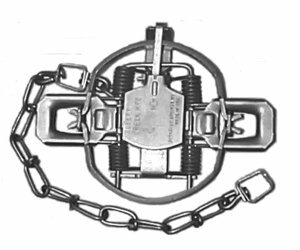 • Chain - #2/0 double link with three swivel points. 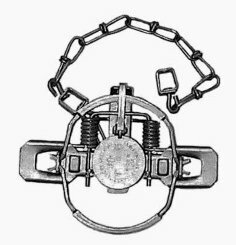 • Springs - .148 diameter hard drawn MB spring wire on regular jaw; .156 diameter on offset jaw. 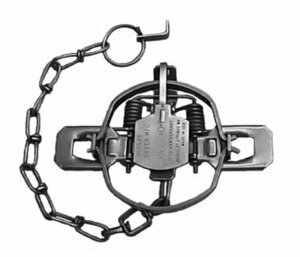 Target Species: Badger, Bobcat, Coyote, Fisher, Fox, Lynx, Nutria, Otter and Raccoon.